37 C.F.R. 1.135 Abandonment for failure to reply within time period. (a) If an applicant of a patent application fails to reply within the time period provided under § 1.134 and § 1.136, the application will become abandoned unless an Office action indicates otherwise. (b) Prosecution of an application to save it from abandonment pursuant to paragraph (a) of this section must include such complete and proper reply as the condition of the application may require. The admission of, or refusal to admit, any amendment after final rejection or any amendment not responsive to the last action, or any related proceedings, will not operate to save the application from abandonment. (c) When reply by the applicant is a bona fide attempt to advance the application to final action, and is substantially a complete reply to the non-final Office action, but consideration of some matter or compliance with some requirement has been inadvertently omitted, applicant may be given a new time period for reply under § 1.134 to supply the omission. 37 C.F.R. 1.137 Revival of abandoned application, or terminated or limited reexamination prosecution. (ii) The period extending beyond twenty years from the date on which the application for the patent was filed in the United States or, if the application contains a specific reference to an earlier filed application(s) under 35 U.S.C. 120, 121, 365(c), or 386(c) from the date on which the earliest such application was filed. (2) Any terminal disclaimer pursuant to paragraph (d)(1) of this section must also apply to any patent granted on a continuing utility or plant application filed before June 8, 1995, or a continuing design application, that contains a specific reference under 35 U.S.C. 120, 121, 365(c), or 386(c) to the application for which revival is sought. (3) The provisions of paragraph (d)(1) of this section do not apply to applications for which revival is sought solely for purposes of copendency with a utility or plant application filed on or after June 8, 1995, to reissue applications, or to reexamination proceedings. (3) The provisions of § 1.956 for a terminated inter partes reexamination prosecution or an inter partes reexamination limited as to further prosecution, where the inter partes reexamination was filed under § 1.913. (f) Abandonment for failure to notify the Office of a foreign filing. A nonprovisional application abandoned pursuant to 35 U.S.C. 122(b)(2)(B)(iii) for failure to timely notify the Office of the filing of an application in a foreign country or under a multinational treaty that requires publication of applications eighteen months after filing, may be revived pursuant to this section. 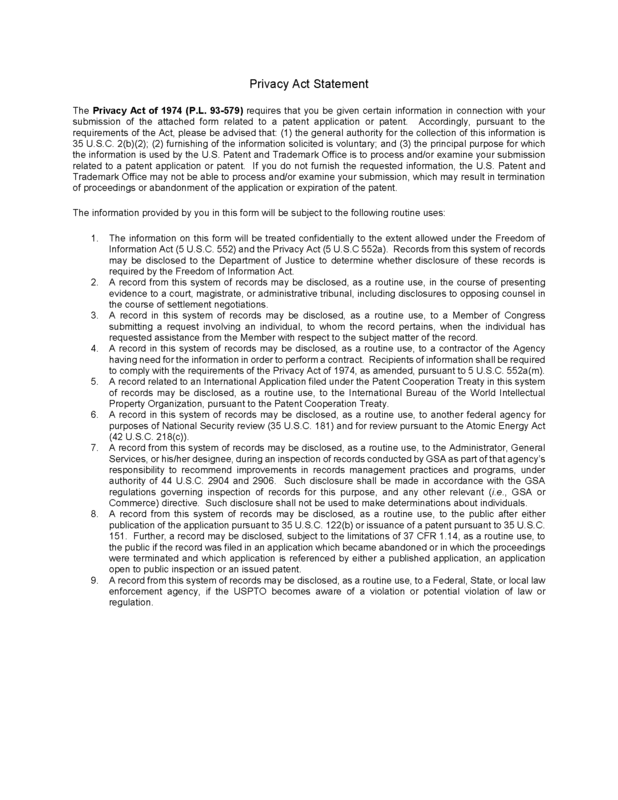 The reply requirement of paragraph (c) of this section is met by the notification of such filing in a foreign country or under a multinational treaty, but the filing of a petition under this section will not operate to stay any period for reply that may be running against the application. (g) Provisional applications. A provisional application, abandoned for failure to timely respond to an Office requirement, may be revived pursuant to this section. 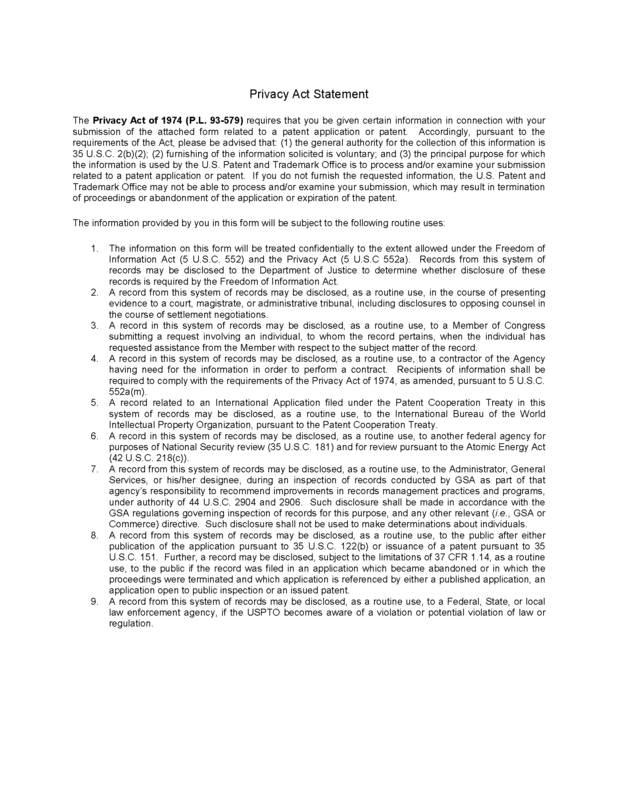 Subject to the provisions of 35 U.S.C. 119(e)(3) and § 1.7(b), a provisional application will not be regarded as pending after twelve months from its filing date under any circumstances. 37 C.F.R. 1.181 Petition to the Director. (3) To invoke the supervisory authority of the Director in appropriate circumstances. For petitions involving action of the Patent Trial and Appeal Board, see § 41.3 of this title. (f) The mere filing of a petition will not stay any period for reply that may be running against the application, nor act as a stay of other proceedings. Any petition under this part not filed within two months of the mailing date of the action or notice from which relief is requested may be dismissed as untimely, except as otherwise provided. This two-month period is not extendable. A petition to revive an abandoned application (discussed below) should not be confused with a petition from an examiner’s holding of abandonment. Where an applicant contends that the application is not in fact abandoned (e.g., there is disagreement as to the sufficiency of the reply, or as to controlling dates), a petition under 37 CFR 1.181(a) requesting withdrawal of the holding of abandonment is the appropriate course of action, and such petition does not require a fee. Where there is no dispute as to whether an application is abandoned (e.g., the applicant’s contentions merely involve the cause of abandonment), a petition under 37 CFR 1.137 (accompanied by the appropriate petition fee) is necessary to revive the abandoned application. The procedure available for reviving an application that has become abandoned due to a failure to reply to an Office Action is a petition under 37 CFR 1.137(a) based on unintentional delay. In Delgar v. Schuyler, 172 USPQ 513 (D.D.C. 1971), the court decided that the Office should mail a new Notice of Allowance in view of the evidence presented in support of the contention that the applicant’s representative did not receive the original Notice of Allowance. Under the reasoning of Delgar, an allegation that an Office action was never received may be considered in a petition to withdraw the holding of abandonment. If adequately supported, the Office may grant the petition to withdraw the holding of abandonment and remail the Office action. That is, the reasoning of Delgar is applicable regardless of whether an application is held abandoned for failure to timely pay the issue fee (35 U.S.C. 151 ) or for failure to prosecute (35 U.S.C. 133 ). A showing by the applicant’s representative may not be sufficient if there are circumstances that point to a conclusion the Office action may have been lost after receipt rather than a conclusion that the Office action was lost in the mail (e.g., if the practitioner has a history of not receiving Office actions). Evidence of nonreceipt of an Office communication or action (e.g., Notice of Abandonment or an advisory action) other than that action to which reply was required to avoid abandonment would not warrant withdrawal of the holding of abandonment. Abandonment takes place by operation of law for failure to reply to an Office action or timely pay the issue fee, not by operation of the mailing of a Notice of Abandonment. See Lorenz v. Finkl, 333 F.2d 885, 889-90, 142 USPQ 26, 29-30 (CCPA 1964); Krahn v. Commissioner, 15 USPQ2d 1823, 1824 (E.D. Va. 1990); In re Application of Fischer, 6 USPQ2d 1573, 1574 (Comm’r Pat. 1988). The showing required to establish nonreceipt of an Office communication must include a statement from the practitioner describing the system used for recording an Office action received at the correspondence address of record with the USPTO. The statement should establish that the docketing system is sufficiently reliable. It is expected that the record would include, but not be limited to, the application number, attorney docket number, the mail date of the Office action and the due date for the response. Practitioner must state that the Office action was not received at the correspondence address of record, and that a search of the practitioner’s record(s), including any file jacket or the equivalent, and the application contents, indicates that the Office action was not received. A copy of the record(s) used by the practitioner where the non-received Office action would have been entered had it been received is required. A copy of the practitioner’s record(s) required to show non-receipt of the Office action should include the master docket for the firm. That is, if a three month period for reply was set in the nonreceived Office action, a copy of the master docket report showing all replies docketed for a date three months from the mail date of the nonreceived Office action must be submitted as documentary proof of nonreceipt of the Office action. If no such master docket exists, the practitioner should so state and provide other evidence such as, but not limited to, the following: the application file jacket; incoming mail log; calendar; reminder system; or the individual docket record for the application in question. When the petitioner is a pro se applicant, the Office understands the petitioner may not have developed a formal docket record system for tracking correspondence. Nevertheless, petitioner must provide some sort of showing explaining the manner in which petitioner receives mail from the USPTO, maintains files for patent matters, and treats mail received for such matter. Specifically, petitioner must explain the system for keeping track of patent matters - where petitioner keeps the correspondence; where due dates are recorded; how petitioner knows replies are due, etc. In essence, petitioner must explain how he reminds himself of response due dates and shows that the due date for an Office action was not entered into that system. Petitioner should include any available documentary evidence of the mail received, covering a reasonable period after the mailing date of an Office action, to demonstrate non-receipt of an Office action. Petitioner should also provide the USPTO with copies of any records or other methods, which could serve as a reminder of the due date for a response to an Office action, and where petitioner would have entered the receipt date of the Office action if petitioner received it (for example, a copy of the outside of a file or a calendar maintained by petitioner), if these documents are available. Furthermore, petitioner must include a statement from himself, or any other person at the address who may have handled the Office action, indicating that a search was conducted of the location where the correspondence from the USPTO would have been kept; however, the Office action was not found. Lastly, petitioner must state that he was, in fact, residing at (or routinely checked) the correspondence address of record for a reasonable time after the mailing date of an Office action; the period when the Office action would have been received. 37 CFR 1.10(c) through 1.10(e) and 1.10(g) set forth procedures for petitioning the Director of the USPTO to accord a filing date to correspondence as of the date of deposit of the correspondence as Priority Mail Express®. A petition to withdraw the holding of abandonment relying upon a timely reply placed in Priority Mail Express® must include an appropriate petition under 37 CFR 1.10(c), (d), (e), or (g) (see MPEP § 513). When a paper is shown to have been mailed to the Office using the "Express Mail" procedures, the paper must be entered in PALM with the Priority Mail Express® date. Similarly, applicants may establish that a reply was filed with a postcard receipt that properly identifies the reply and provides prima facie evidence that the reply was timely filed. See MPEP § 503. For example, if the application has been held abandoned for failure to file a reply to a first Office action, and applicant has a postcard receipt showing that an amendment was timely filed in response to the Office action, then the holding of abandonment should be withdrawn upon the filing of a petition to withdraw the holding of abandonment. When the reply is shown to have been timely filed based on a postcard receipt, the reply must be entered into PALM using the date of receipt of the reply as shown on the post card receipt. Where a certificate of mailing under 37 CFR 1.8, but not a postcard receipt, is relied upon in a petition to withdraw the holding of abandonment, see 37 CFR 1.8(b) and MPEP § 512. As stated in 37 CFR 1.8(b)(3) the statement that attests to the previous timely mailing or transmission of the correspondence must be on a personal knowledge basis, or to the satisfaction of the Director of the USPTO. If the statement attesting to the previous timely mailing is not made by the person who signed the Certificate of Mailing (i.e., there is no personal knowledge basis), then the statement attesting to the previous timely mailing should include evidence that supports the conclusion that the correspondence was actually mailed (e.g., copies of a mailing log establishing that correspondence was mailed for that application). When the correspondence is shown to have been timely filed based on a certificate of mailing, the correspondence is entered into PALM with the actual date of receipt (i.e., the date that the duplicate copy of the papers was filed with the statement under 37 CFR 1.8 ). 37 CFR 1.8(b) also permits applicant to notify the Office of a previous mailing or transmission of correspondence and submit a statement under 37 CFR 1.8(b)(3) accompanied by a duplicate copy of the correspondence when a reasonable amount of time (e.g., more than one month) has elapsed from the time of mailing or transmitting of the correspondence. Applicant does not have to wait until the application becomes abandoned before notifying the Office of the previous mailing or transmission of the correspondence. Applicant should check the private Patent Application Information Retrieval (PAIR) system for the status of the correspondence before notifying the Office. See MPEP § 512. 37 CFR 1.181(f) provides that, inter alia, except as otherwise provided, any petition not filed within 2 months from the action complained of may be dismissed as untimely. Therefore, any petition (under 37 CFR 1.181 ) to withdraw the holding of abandonment not filed within 2 months of the mail date of a notice of abandonment (the action complained of) may be dismissed as untimely. 37 CFR 1.181(f). Rather than dismiss an untimely petition to withdraw the holding of abandonment under 37 CFR 1.181(f), the Office may require a terminal disclaimer as a condition of granting an untimely petition to withdraw the holding of abandonment. Where the record indicates that the applicant intentionally delayed the filing of a petition to withdraw the holding of abandonment, the Office may simply dismiss the petition as untimely (37 CFR 1.181(f) ) solely on the basis of such intentional delay in taking action in the application without further addressing the merits of the petition. Obviously, intentional delay in seeking the revival of an abandoned application precludes relief under 37 CFR 1.137(a) (discussed below). (B) the filing date of a grantable petition to withdraw the holding of abandonment. See MPEP § 711.03(c), subsection II.G. In utility and plant applications filed on or after June 8, 1995, but before May 29, 2000, a terminal disclaimer should not be required as a condition of granting an untimely petition to withdraw the holding of abandonment. However, the Office of Patent Legal Administration (OPLA) must be consulted in such situations if the holding of abandonment involves a period during: (A) appellate review by the Patent Trial and Appeal Board; (B) an interference or derivation proceeding under 35 U.S.C. 135, including any suspension due to an interference or derivation proceeding; or (C) which the application was in a sealed condition or prosecution was suspended due to a secrecy order under 35 U.S.C. 181. This is because it is necessary to effect (if appropriate) a reduction of patent term extension under the "due diligence" provisions of 37 CFR 1.701(d)(2). In utility and plant applications filed on or after May 29, 2000, a terminal disclaimer should not be required as a condition of granting an untimely petition to withdraw the holding of abandonment. This is because any patent term adjustment is automatically reduced under the provisions of 37 CFR 1.704(c)(4) in applications subject to the patent term adjustment provisions of the American Inventors Protection Act of 1999 (AIPA) if a petition to withdraw a holding of abandonment is not filed within two months from the mailing date of the notice of abandonment, and if applicant does not receive the notice of abandonment, any patent term adjustment is reduced under the provisions of 37 CFR 1.704(a) by a period equal to the period of time during which the applicant "failed to engage in reasonable efforts to conclude prosecution" (processing or examination) of the application. Effective December 18, 2013, the Patent Law Treaties Implementation Act of 2012 (PLTIA), Public Law 112-211, amended the patent laws to implement the provisions of the Patent Law Treaty (PLT) in title II. Notable changes to the law included the restoration of patent rights via the revival of abandoned applications and acceptance of delayed maintenance fee payments. Section 201(b) of the PLTIA specifically added new 35 U.S.C. 27, providing that the Director may establish procedures to revive an unintentionally abandoned application for patent, accept an unintentionally delayed payment of the fee for issuing a patent, or accept an unintentionally delayed response by the patent owner in a reexamination proceeding, upon petition by the applicant for patent or patent owner. The PLTIA eliminated the provisions of the patent statutes relating to revival of abandoned applications or acceptance of delayed maintenance fee payments on the basis of a showing of "unavoidable" delay. 35 U.S.C. 27 Revival of applications; reinstatement of reexamination proceedings. (E) to provide copendency between the abandoned application and a subsequently filed application. (D) a statement that the entire delay in filing the required reply from the due date for the reply until the filing of a grantable petition pursuant to 37 CFR 1.137 was unintentional. The Director of the USPTO may require additional information where there is a question whether the delay was unintentional. Unlike a petition to withdraw the holding of abandonment, a petition to revive under 37 CFR 1.137 must be accompanied by, inter alia, the required reply. Generally, the required reply is the reply sufficient to have avoided abandonment, had such reply been timely filed. A petition for an extension of time under 37 CFR 1.136 and a fee for such an extension of time are not required to be included with the reply. 37 CFR 1.137(c) applies to the reply requirement for a petition under 37 CFR 1.137(a). In an application abandoned under 37 CFR 1.57(a), the reply must include a copy of the specification and any drawings of the previously filed application. In an application or patent abandoned for failure to pay the issue fee or any portion thereof, the required reply must include payment of the issue fee or any outstanding balance. In an application abandoned for failure to pay the publication fee, the required reply must include payment of the publication fee. In a nonprovisional application abandoned for failure to prosecute, the required reply may be met by the filing of a continuing application. In a nonprovisional utility or plant application filed on or after June 8, 1995, abandoned after the close of prosecution as defined in 37 CFR 1.114(b), the required reply may also be met by the filing of a request for continued examination (RCE) in compliance with 37 CFR 1.114. See below for more details on the reply requirement in specific situations of abandonment. In an application abandoned under 37 CFR 1.57(a), the required reply must include a copy of the specification and any drawings of the previously filed application. Although not required as a condition for revival, a certified copy of the previously filed application may be required for an application filed by reference. If the certified copy is required and is not filed within the later of four months from the filing date of the application or sixteen months from the filing date of the previously filed application, a petition including a showing of good and sufficient cause for the delay and the petition fee set forth in 37 CFR 1.17 are required. For more details regarding an application filed by reference under 35 U.S.C. 111(c) and 37 CFR 1.57(a), see MPEP § 601.01(a), subsection III. In an application abandoned for failure to timely pay the issue fee, the required reply must include the issue fee (and any required publication fee). Section 202(b)(6) of the PLTIA amended 35 U.S.C. 151 to provide that: (1) if it appears that an applicant is entitled to a patent under the law, a written notice of allowance of the application shall be given or mailed to the applicant; (2) the notice of allowance shall specify a sum, constituting the issue fee and any required publication fee, which shall be paid within three months thereafter; and (3) upon payment of this sum, the patent may issue, but if payment is not timely made, the application shall be regarded as abandoned. Under the changes to 35 U.S.C. 151 in the PLTIA, the sum specified in the notice of allowance will constitute the issue fee and any required publication fee, and the Office will proceed to issue a patent when the applicant pays the sum specified in the notice of allowance, regardless of the issue fee and/or publication fee in effect on the date the sum specified in the notice of allowance is paid. Section 201(b) of the PLTIA specifically added new 35 U.S.C. 27, providing that the Director may establish procedures to revive an unintentionally abandoned application for a patent, accept an unintentionally delayed payment of the fee for issuing a patent, or accept an unintentionally delayed response by the patent owner in a reexamination proceeding, upon petition by the applicant for patent or patent owner. 35 U.S.C. 41(a)(7) authorizes the acceptance of an "unintentionally delayed payment of the fee for issuing each patent." Thus, 35 U.S.C. 41(a)(7) requires payment of the issue fee as a condition of reviving an application abandoned for failure to pay the issue fee. Therefore, the filing of a continuing application without payment of the issue fee is not an acceptable reply in an application abandoned for failure to pay the issue fee. The issue fee due with the petition to revive is the issue fee specified in the notice of allowance. If the notice of allowance also specified a publication fee, then the publication fee must also be paid in the amount specified on the notice of allowance. An applicant may change the entity status with the filing of the petition to revive, if appropriate, and pay the petition fee in the new entity status amount, but the issue fee (and any publication fee) must be paid in the amount specified in the notice of allowance. In an application abandoned for failure to pay the publication fee, the required reply must include payment of the publication fee. Even if an application abandoned for failure to pay the publication fee is being revived solely for purposes of continuity with a continuing application, the petition to revive under 37 CFR 1.137 must include payment of the publication fee. In an application abandoned for failure to provide required drawings, a petition to revive the application will be dismissed unless the required drawings are filed before or with the petition to revive the application. 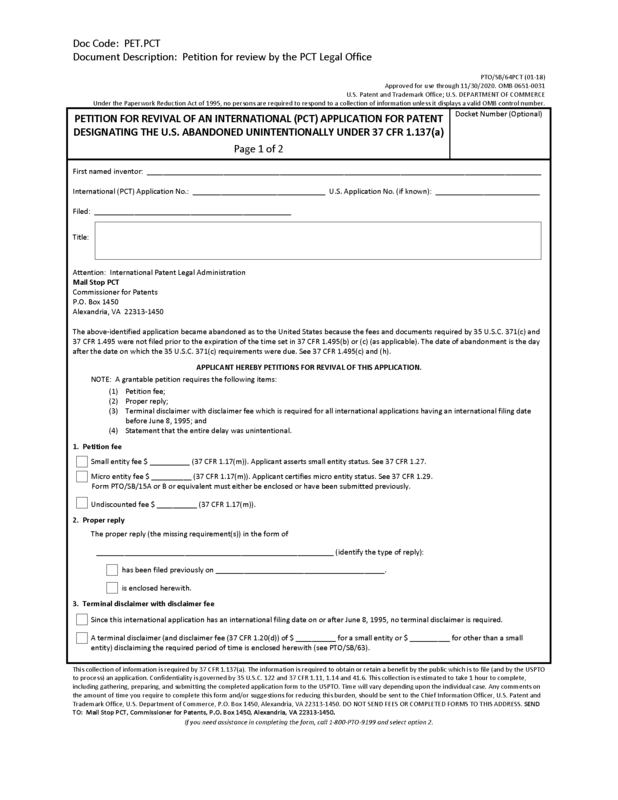 (B) the filing of a continuing application under 37 CFR 1.53(b) (or a continued prosecution application (CPA) under 37 CFR 1.53(d) if the application is a design application). The grant of a petition under 37 CFR 1.137 is not a determination that any reply under 37 CFR 1.111 is complete. Where the proposed reply is to a non-final Office action, the petition may be granted if the reply appears to be bona fide. After revival of the application, the patent examiner may, upon more detailed review, determine that the reply is lacking in some respect. In this limited situation, the patent examiner should send out a letter giving a 2-month shortened statutory period under 37 CFR 1.135(c) for correction of the error or omission. Extensions of time under 37 CFR 1.136(a) are permitted. If applicant does not correct the omission within the time period set in the letter (including any extension), the application is again abandoned. (D) the filing of a continuing application under 37 CFR 1.53(b) (or a CPA under 37 CFR 1.53(d) if the application is a design application). When a notice of appeal is the reply filed pursuant to 37 CFR 1.137(b)(1), the time period under 37 CFR 41.37 for filing the appeal brief will be set by the Director of the USPTO in the decision granting the petition. An application subject to a final action in which a proposed amendment under 37 CFR 1.116 is filed as the required reply will normally be routed by the Office of Petitions to the Technology Center (TC) to determine whether a proposed amendment places the application in condition for allowance prior to granting any petition to revive such application. The examiner is instructed that if the reply places the application in condition for allowance, the examiner should use the typewriter tool in Adobe Acrobat to write in the margin of the reply "OK to enter upon revival." If the petition is otherwise grantable and the examiner indicates that the reply places the application in condition for allowance, the petition will be granted. If, on the other hand, the reply would not place the application in condition for allowance, the examiner is instructed to complete form PTOL-303 and return the form to the Office of Petitions with the application. Form PTOL-303 should not be mailed to the applicant by the examiner. In this situation, the Office of Petitions will not grant the petition. A copy of the form PTOL-303 is marked with the notation "Courtesy Copy" by the Office of Petitions. The courtesy copy is sent as an attachment with the decision on the petition. The advisory form PTOL-303 merely serves as an advisory notice to the Office of Petitions regarding the decision of the examiner on the amendment after final rejection. (C) the filing of a continuing application under 37 CFR 1.53(b) (or a CPA under 37 CFR 1.53(d) if the application is a design application). For utility or plant applications abandoned for failure to reply to a final Office action or for failure to file an appeal brief, the required reply may be the filing of an RCE accompanied by a submission and the requisite fee. When an RCE is the reply filed pursuant to 37 CFR 1.137(b)(1) to revive such an application, the submission accompanying the RCE must be a reply responsive within the meaning of 37 CFR 1.111 to the last Office action. Consideration of whether the submission is responsive within the meaning of 37 CFR 1.111 to the last Office action is done without factoring in the "final" status of such action. The submission may be a previously filed amendment after final or a statement that incorporates by reference the arguments in a previously filed appeal or reply brief. See MPEP § 706.07(h), subsection II. The petition may be granted if the submission appears to be a bona fide attempt to provide a complete reply to the last Office action. After revival of the application, the examiner may, upon a more detailed review, determine that the reply is lacking in some respect. In this limited situation, the examiner should send out a letter giving a 2-month shortened statutory period under 37 CFR 1.135(c) for correction of the error or omission. Extensions of time under 37 CFR 1.136(a) are permitted. If the applicant does not correct the omission within the time period set in the letter (including any extension), the application is again abandoned. (C) the reply or replies submitted under 37 CFR 1.137(b)(1) ) are questionable as to compliance with 37 CFR 1.111 or 1.113. If an applicant makes a nonpublication request upon filing with the appropriate certifications, the utility or plant application filed on or after November 29, 2000 will not be published under 35 U.S.C. 122(b)(1). See 35 U.S.C. 122(b)(2)(B)(i). If an applicant makes a nonpublication request and then rescinds, pursuant to 35 U.S.C. 122(b)(2)(B)(ii), the nonpublication request before or on the date a counterpart application is filed in a foreign country, or under a multilateral international agreement, that requires eighteen-month publication, the nonpublication request will be treated as annulled and the application will be treated as if the nonpublication request were never made. See MPEP §§ 1123 and 1124. An applicant who has made a nonpublication request, but who subsequently files an application directed to the invention disclosed in the U.S. application in a foreign country, or under a multilateral international agreement, that requires eighteen-month publication before the nonpublication request is rescinded, must, in addition to the rescission, notify the Office of such filing within forty-five days after the date of such filing. The requirement in 35 U.S.C. 122(b)(2)(B)(iii) for notice of the foreign filing is in addition to any rescission of the nonpublication request under 35 U.S.C. 122(b)(2)(B)(ii). If an applicant files a counterpart application in a foreign country after having filed an application in the USPTO with a nonpublication request, filing a rescission of the nonpublication request under 35 U.S.C. 122(b)(2)(B)(ii) without also providing a notice of the foreign filing in a timely manner will result in the abandonment of the U.S. application under 35 U.S.C. 122(b)(2)(B)(iii). 37 CFR 1.137(f), however, provides that an application abandoned as a result of the failure to timely provide such a notice to the Office is subject to revival pursuant to 37 CFR 1.137 if the delay in submitting the notice was unintentional. A nonprovisional application abandoned pursuant to 35 U.S.C. 122(b)(2)(B)(iii) for failure to timely notify the Office of the filing of an application in a foreign country or under a multinational treaty that requires eighteen-month publication may be revived only on the basis of unintentional delay pursuant to 37 CFR 1.137. The reply requirement of 37 CFR 1.137(c) is met by the notification of such filing in a foreign country or under a multinational treaty, but the filing of a petition under 37 CFR 1.137 will not operate to stay any period for reply that may be running against the application. Since the Office cannot ascertain whether an application is abandoned under 35 U.S.C. 122(b)(2)(B)(iii), the Office may continue to process and examine the application until the Office is notified of applicant’s failure to meet the forty-five days notice requirement of 35 U.S.C. 122(b)(2)(B)(iii). Therefore, the filing of a petition under 37 CFR 1.137 to revive such an application will not operate to stay any period for reply that may be running against the application. 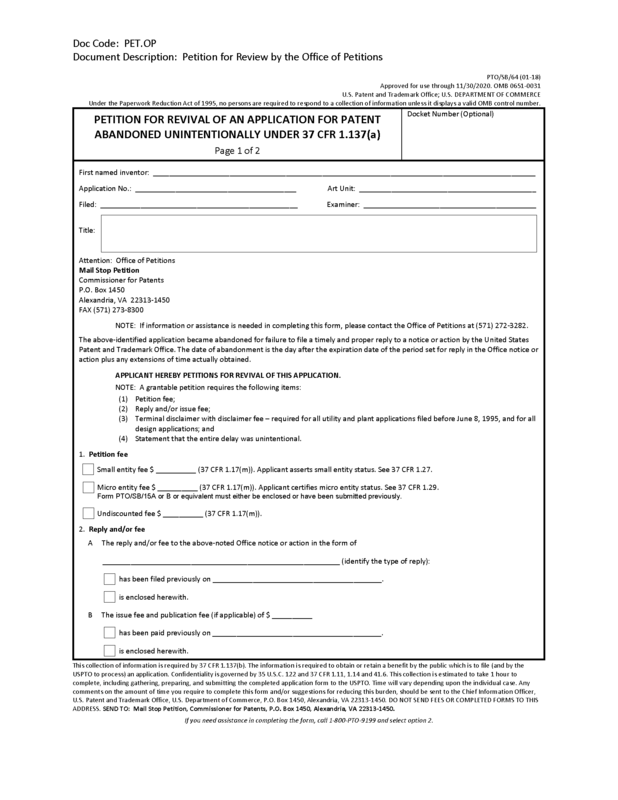 Applicants may use form PTO/SB/64a to file a petition for revival under 37 CFR 1.137. 35 U.S.C. 41(a)(7) provides that the Office shall charge $1,700.00 on filing each petition for the revival of an abandoned application for a patent, for the delayed payment of the fee for issuing each patent, for the delayed response by the patent owner in any reexamination proceeding, for the delayed payment of the fee for maintaining a patent in force, for the delayed submission of a priority or benefit claim, or for the extension of the 12-month period for filing a subsequent application. 35 U.S.C. 41(a)(7) also provides that the Director may refund any part of the fee, in exceptional circumstances as determined by the Director. This provision permits the Office to refund (or waive) the fee specified in 35 U.S.C. 41(a)(7) in situations in which the failure to take the required action or pay the required fee was due to a widespread disaster, such as a hurricane, earthquake, or flood, in the manner that the Office would waive surcharges that are not required by statute. The "exceptional circumstances" provision does not permit applicants to request a refund on the basis of there being exceptional circumstances. The phrase "[o]n filing" in 35 U.S.C. 41(a)(7) means that the petition fee is required for the filing (and not merely the grant) of a petition under 37 CFR 1.137. See H.R. Rep. No. 542, 97th Cong., 2d Sess. 6 (1982), reprinted in 1982 U.S.C.C.A.N. 770 ("[t]he fees set forth in this section are due on filing the petition"). Therefore, the Office: (A) will not refund the petition fee required by 37 CFR 1.17(m), regardless of whether the petition under 37 CFR 1.137 is dismissed or denied (unless there are exceptional circumstances as determined by the Director); and (B) will not reach the merits of any petition under 37 CFR 1.137 lacking the requisite petition fee. While the Office reserves the authority to require further information concerning the cause of abandonment and delay in filing a petition to revive, the Office relies upon the applicant’s duty of candor and good faith and accepts the statement that "the entire delay in filing the required reply from the due date for the reply until the filing of a grantable petition pursuant to 37 CFR 1.137(a) was unintentional" without requiring further information in the vast majority of petitions under 37 CFR 1.137(a). This is because the applicant is obligated under 37 CFR 11.18 to inquire into the underlying facts and circumstances when a practitioner provides this statement to the Office. In addition, providing an inappropriate statement in a petition under 37 CFR 1.137(a) to revive an abandoned application may have an adverse effect when attempting to enforce any patent resulting from the application. See Lumenyte Int’l Corp. v. Cable Lite Corp., Nos. 96-1011, 96-1077, 1996 U.S. App. LEXIS 16400, 1996 WL 383927 (Fed. Cir. July 9, 1996)(unpublished)(patents held unenforceable due to a finding of inequitable conduct in submitting an inappropriate statement that the abandonment was unintentional). The Office is almost always satisfied as to whether "the entire delay…was unintentional" on the basis of statement(s) by the applicant or representative explaining the cause of the delay (accompanied at most by copies of correspondence relevant to the period of delay). The legislative history of Public Law 97-247, § 3, 96 Stat. 317 (1982), reveals that the purpose of 35 U.S.C. 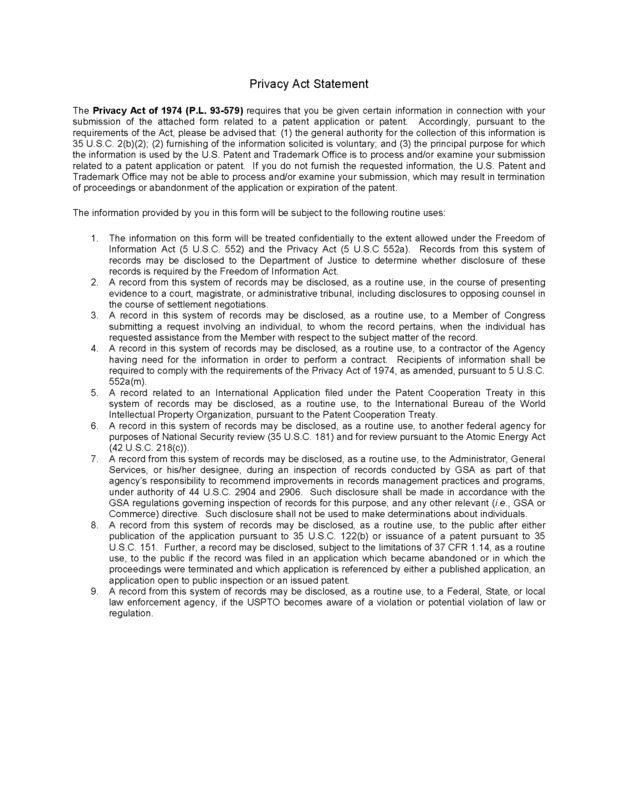 41(a)(7) is to permit the Office to have discretion to revive abandoned applications in appropriate circumstances, but places a limit on this discretion stating that "[u]nder this section a petition accompanied by [the requisite fee] would not be granted where the abandonment or the failure to pay the fee for issuing the patent was intentional as opposed to being unintentional or unavoidable." H.R. Rep. No. 542, 97th Cong., 2d Sess. 6-7 (1982), reprinted in 1982 U.S.C.C.A.N. 770-71. A delay resulting from a deliberately chosen course of action on the part of the applicant is not an "unintentional" delay within the meaning of 37 CFR 1.137. Where the applicant deliberately permits an application to become abandoned (e.g., due to a conclusion that the claims are unpatentable, that a rejection in an Office action cannot be overcome, or that the invention lacks sufficient commercial value to justify continued prosecution), the abandonment of such application is considered to be a deliberately chosen course of action, and the resulting delay cannot be considered as "unintentional" within the meaning of 37 CFR 1.137. See In re Application of G, 11 USPQ2d 1378, 1380 (Comm’r Pat. 1989). An intentional course of action is not rendered unintentional when, upon reconsideration, the applicant changes his or her mind as to the course of action that should have been taken. See In re Maldague, 10 USPQ2d 1477, 1478 (Comm’r Pat. 1988). (E) the applicant remains interested in eventually obtaining a patent, but simply seeks to defer patent fees and patent prosecution expenses. Likewise, a change in circumstances that occurred subsequent to the abandonment of an application does not render "unintentional" the delay resulting from a previous deliberate decision to permit an application to be abandoned. These matters simply confuse the question of whether there was a deliberate decision not to continue the prosecution of an application with why there was a deliberate decision not to continue the prosecution of an application. 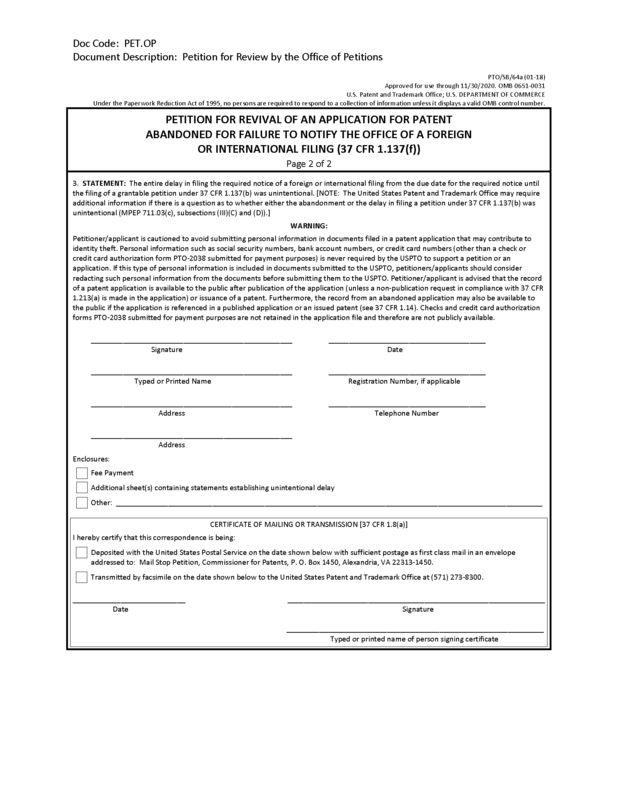 In order to expedite treatment, applicants filing a petition under 37 CFR 1.137 to revive an abandoned application are advised to include the statement "the entire delay in filing the required reply from the due date for the reply until the filing of a grantable petition pursuant to 37 CFR 1.137(a) was unintentional," even if applicant chooses to include a statement of the facts concerning the delay. 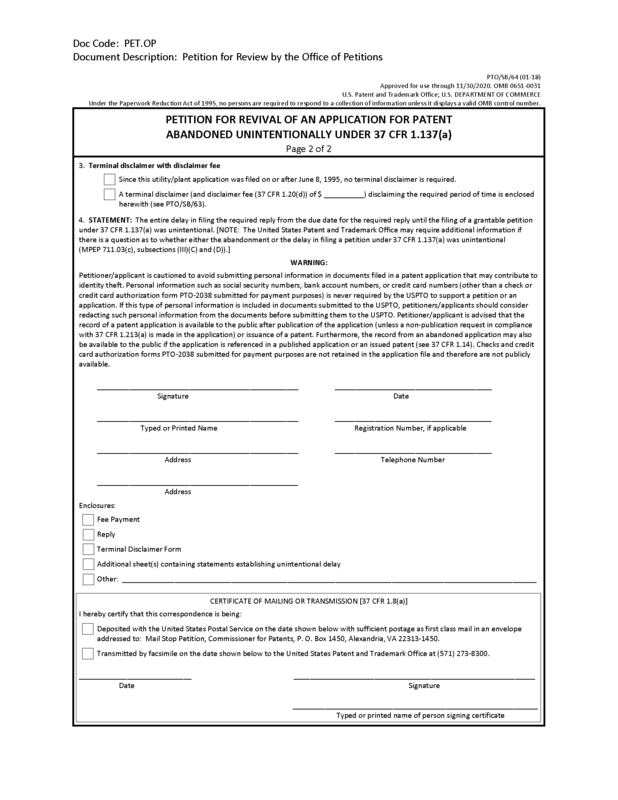 Electronic petitions, that are automatically processed and immediately decided, may be filed using the Web-based ePetition process for the following types of petitions: (1) Petitions to Accept Late Payment of Issue Fee - Unintentional Late Payment (37 CFR 1.137(a)); (2) Petitions for Revival of an Application based on Failure to Notify the Office of a Foreign or International Filing (37 CFR 1.137(f) ); (3) Petitions for Revival of an Application for Continuity Purposes Only (37 CFR 1.137(a) ); and (4) Petitions for Revival of an Abandoned Patent Application Abandoned Unintentionally (37 CFR 1.137(a) ) (For Cases Abandoned After 1st Action and Prior to Notice of Allowance). Applicants may use the forms provided by the Office (PTO/SB/64, PTO/SB/64a, or PTO/SB/64PCT). Additional information regarding the ePetition process is available from: www.uspto.gov/patents-application-process/applying-online/ epetition-resource-page. Applicants may use the forms provided by the Office (PTO/SB/64, PTO/SB/64a, or PTO/SB/64PCT). (C) the delay in filing a grantable petition pursuant to 37 CFR 1.137 to revive the application. (C) the discovery of new information or evidence, or other change in circumstances subsequent to the abandonment or decision not to seek or persist in seeking revival. Obviously, delaying the revival of an abandoned application, by a deliberately chosen course of action, until the industry or a competitor shows an interest in the invention is the antithesis of an "unintentional" delay. An intentional abandonment of an application, or an intentional delay in seeking the revival of an abandoned application, precludes a finding of unavoidable or unintentional delay pursuant to 37 CFR 1.137. See Maldague, 10 USPQ2d at 1478. 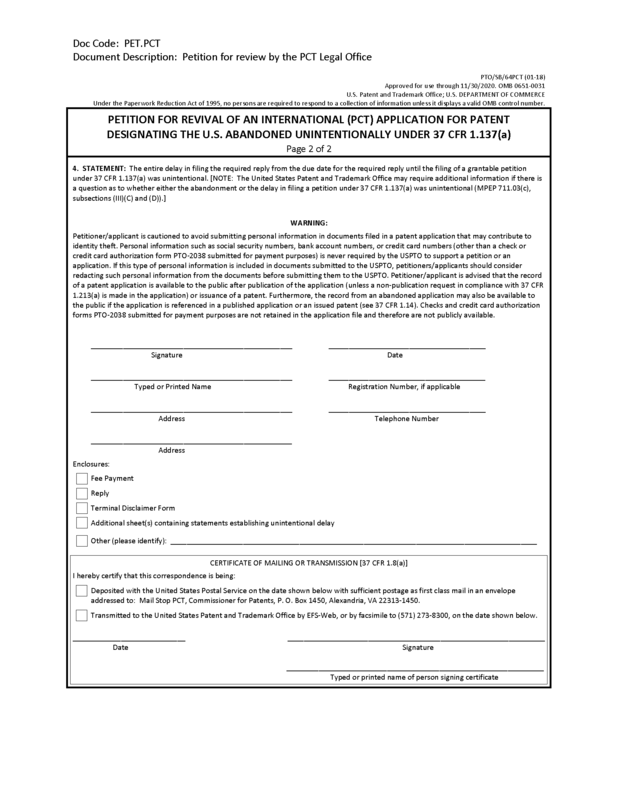 The Office does not generally question whether there has been an intentional or otherwise impermissible delay in filing an initial petition pursuant to 37 CFR 1.137, when such petition is filed: (A) within 3 months of the date the applicant is first notified that the application is abandoned; and (B) within 1 year of the date of abandonment of the application. 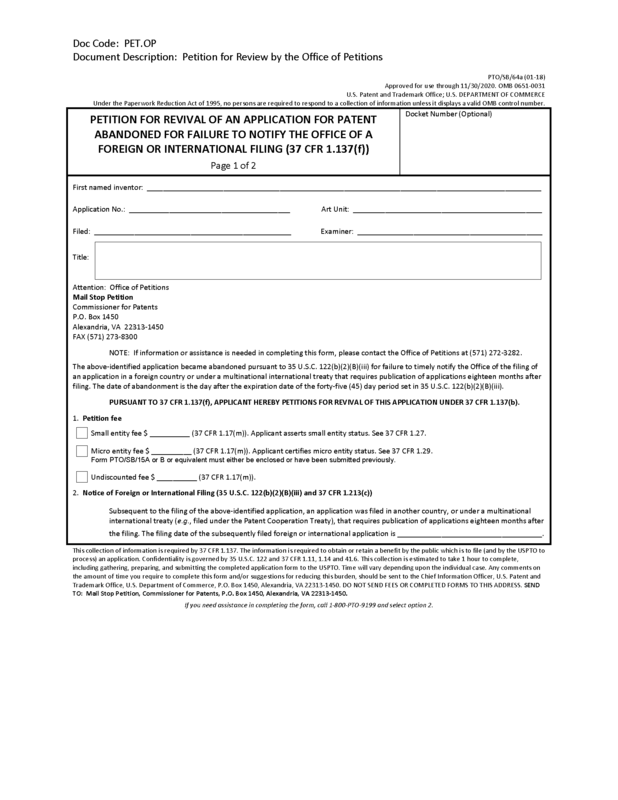 Thus, an applicant seeking revival of an abandoned application is advised to file a petition pursuant to 37 CFR 1.137 within 3 months of the first notification that the application is abandoned to avoid the question of intentional delay being raised by the Office (or by third parties seeking to challenge any patent issuing from the application). Where a petition pursuant to 37 CFR 1.137 is not filed within 3 months of the date the applicant is first notified that the application is abandoned, the Office may consider there to be a question as to whether the delay was unintentional. In such instances the Office may require further information as to the cause of the delay between the date the applicant was first notified that the application was abandoned and the date a 37 CFR 1.137 petition was filed, and how such delay was "unintentional." To avoid delay in the consideration of the merits of a petition under 37 CFR 1.137 in instances in which such petition was not filed within 3 months of the date the applicant was first notified that the application was abandoned, applicants should include a showing as to how the delay between the date the applicant was first notified by the Office that the application was abandoned and the filing of a petition under 37 CFR 1.137 was "unintentional." (B) a showing as to how the delay in discovering the abandoned status of the application occurred despite the exercise of due care or diligence on the part of the applicant (or applicant’s representative). (B) a showing as to how the delay in discovering the abandoned status of the application occurred despite the exercise of due care or diligence on the part of the applicant. Applicant’s failure to carry the burden of proof to establish that the "entire" delay was "unintentional" may lead to the denial of a petition under 37 CFR 1.137, regardless of the circumstances that originally resulted in the abandonment of the application. The question under 37 CFR 1.137 is whether the delay on the part of the party having the right or authority to reply to avoid abandonment (or not reply) was unintentional. When the applicant assigns the entire right, title, and interest in an invention to a third party (and thus does not retain any legal or equitable interest in the invention), the applicant’s delay is irrelevant in evaluating whether the delay was unintentional. See Kim v. Quigg, 718 F. Supp. 1280, 1284, 12 USPQ2d 1604, 1607-08 (E.D. Va. 1989). When an applicant assigns the application to a third party (e.g., the inventor/applicant’s employer), and the third party decides not to file a reply to avoid abandonment, the applicant’s actions, inactions or intentions are irrelevant under 37 CFR 1.137, unless the third party has reassigned the application to the applicant prior to the due date for the reply. Id. Likewise, where the applicant permits a third party (whether a partial assignee, licensee, or other party) to control the prosecution of an application, the third party’s decision whether or not to file a reply to avoid abandonment is binding on the applicant. See Winkler, 221 F. Supp. at 552, 138 USPQ at 667. Where an applicant enters an agreement with a third party for the third party to take control of the prosecution of an application, the applicant will be considered to have given the third party the right and authority to prosecute the application to avoid abandonment (or not prosecute), unless, by the express terms of the contract between applicant and the third party, the third party is conducting the prosecution of the application for the applicant solely in a fiduciary capacity. See Futures Technology Ltd. v. Quigg, 684 F. Supp. 430, 431, 7 USPQ2d 1588, 1589 (E.D. Va. 1988). Otherwise, the applicant will be considered to have given the third party unbridled discretion to prosecute (or not prosecute) the application to avoid abandonment, and will be bound by the actions or inactions of such third party. 37 CFR 1.137(b)(4) requires that a petition under 37 CFR 1.137 must be accompanied by a statement that the entire delay in providing the required reply from the due date for the reply until the filing of a grantable petition pursuant to 37 CFR 1.137 was unintentional, but also provides that "[t]he Director may require additional information where there is a question whether the delay was unintentional." While the Office will generally require only the statement that the entire delay in providing the required reply from the due date for the reply until the filing of a grantable petition pursuant to 37 CFR 1.137 was unintentional, the Office may require an applicant to carry the burden of proof to establish that the delay from the due date for the reply until the filing of a grantable petition was unintentional within the meaning of 35 U.S.C. 27 and 37 CFR 1.137 where there is a question whether the entire delay was unintentional. See Application of G, 11 USPQ2d at 1380. (C) a nonprovisional plant application (other than a reissue application) filed before June 8, 1995. In addition, a terminal disclaimer (and fee) is also required for a utility or plant application filed on or after June 8, 1995, but before May 29, 2000, where the application became abandoned (1) during appeal, (2) during interference, or (3) while under a secrecy order. The reason being that utility and plant patents issuing on applications filed on or after June 8, 1995, but before May 29, 2000, are eligible for the patent term extension under former 35 U.S.C. 154(b) (as a result of the Uruguay Round Agreements Act (URAA)). See 35 U.S.C. 154(b) (1999); see also 37 CFR 1.701. If such an application is abandoned (1) during appeal, (2) during interference, or (3) while under a secrecy order, the patentee of a patent issuing from such an application is eligible for patent term extension for the entire period of abandonment. The requirement for a terminal disclaimer for these situations will make certain that any patent term extension obtained for the period of abandonment while the application is under appeal, interference, or a secrecy order will be dedicated to the public. For utility and plant applications filed on or after May 29, 2000, a terminal disclaimer (and fee) is not required since the period of abandonment is reduced from the patent term adjustment pursuant to 37 CFR 1.704. The terminal disclaimer submitted in a design application must dedicate to the public a terminal part of the term of any patent granted thereon equivalent to the period of abandonment of the application. The terminal disclaimer submitted in either a utility or plant application filed before June 8, 1995 must dedicate to the public a terminal part of the term of any patent granted thereon equivalent to the lesser of: (1) the period of abandonment of the application; or (2) the period extending beyond twenty years from the date on which the application for the patent was filed in the United States or, if the application contains a specific reference to an earlier filed application(s) under 35 U.S.C. 120, 121, or 365(c), from the date on which the earliest such application was filed. The terminal disclaimer must also apply to any patent granted on any continuing utility or plant application filed before June 8, 1995, or any continuing design application, entitled under 35 U.S.C. 120, 121, or 365(c) to the benefit of the filing date of the application for which revival is sought. The terminal disclaimer requirement of 37 CFR 1.137(d) does not apply to (A) applications for which revival is sought solely for purposes of copendency with a utility or plant application filed on or after June 8, 1995, (B) reissue applications, or (C) reexamination proceedings. The Office cannot determine (at the time a petition to revive is granted) the period disclaimed (i.e., which period is lesser: the period of abandonment of the application, or the period extending beyond twenty years from the date on which the application for the patent was filed in the United States or, if the application contains a specific reference to an earlier filed application(s) under 35 U.S.C. 120, 121, or 365(c), from the date on which the earliest such application was filed). Therefore, the Office will not indicate the period disclaimed under 37 CFR 1.137(d) in its decision granting a petition to revive an abandoned application. The filing of a terminal disclaimer is not a substitute for unintentional delay. See Application of Takao, 17 USPQ2d at 1159. The requirement that the entire delay have been unintentional (37 CFR 1.137 ) is distinct from the requirement for a terminal disclaimer. Therefore, the filing of a terminal disclaimer cannot excuse an intentional delay in filing a petition or renewed petition to revive an abandoned application. Likewise, an unintentional delay in filing a petition or renewed petition to revive an abandoned application will not warrant waiver of the terminal disclaimer requirement of 37 CFR 1.137(d). In the event that an applicant considers the requirement for a terminal disclaimer to be inappropriate under the circumstances of the application at issue, the applicant should file a petition under 37 CFR 1.183 (and petition fee) to request a waiver of this requirement of 37 CFR 1.183. Such a petition may request waiver of this requirement in toto, or to the extent that such requirement exceeds the period considered by applicant as the appropriate period of disclaimer. The grant of such a petition, however, is strictly limited to situations wherein applicant has made a showing of an "extraordinary situation" in which "justice requires" the requested relief. An example of such a situation is when the abandonment of the application caused no actual delay in prosecution (e.g., an application awaiting decision by the Board of Appeals and Interferences during period of abandonment). See MPEP § 1490 for additional information pertaining to terminal disclaimers. 37 CFR 1.137(e) requires that any request for reconsideration or review of a decision refusing to revive an abandoned application must be filed within 2 months of the decision refusing to revive or within such time as set in the decision. 37 CFR 1.137(e) further provides that, unless a decision indicates otherwise, this time period for requesting reconsideration or review may be extended under the provisions of 37 CFR 1.136. 37 CFR 1.137(e) specifies a time period within which a renewed petition pursuant to 37 CFR 1.137 must be filed to be considered timely. Where an applicant files a renewed petition, request for reconsideration, or other petition seeking review of a prior decision on a petition pursuant to 37 CFR 1.137 outside the time period specified in 37 CFR 1.137(e), the Office may require, inter alia, a specific showing as to how the entire delay was "unintentional." As discussed above, a delay resulting from the applicant deliberately choosing not to persist in seeking the revival of an abandoned application cannot be considered "unintentional" within the meaning of 37 CFR 1.137, and the correctness or propriety of the decision on the prior petition pursuant to 37 CFR 1.137, the correctness of the applicant’s (or the applicant’s representative’s) decision not to persist in seeking revival, the discovery of new information or evidence, or other change in circumstances subsequent to the abandonment or decision to not persist in seeking revival are immaterial to such intentional delay caused by the deliberate course of action chosen by the applicant. 37 CFR 1.137 is applicable to a provisional application abandoned for failure to reply to an Office requirement. A petition under 37 CFR 1.137(a) must be accompanied by any outstanding reply to an Office requirement, since 37 CFR 1.137(c) permits the filing of a continuing application in lieu of the required reply only in a nonprovisional application. 35 U.S.C. 111(b)(5) provides that a provisional application shall be regarded as abandoned 12 months after its filing date and shall not be subject to revival after such 12-month period. 37 CFR 1.137(g) provides that a provisional application, abandoned for failure to timely respond to an Office requirement, may be revived pursuant to 37 CFR 1.137, however a provisional application will not be regarded as pending after twelve months from its filing date under any circumstances. Note that the pendency of a provisional application is extended to the next succeeding secular or business day if the day that is twelve months after the filing date of the provisional application falls on a Saturday, Sunday, or federal holiday within the District of Columbia. See 35 U.S.C. 119(e)(3). A provisional application may be abandoned prior to 12 months from its filing date for failure to reply to an Office requirement (e.g., failure to submit the filing fee and/or cover sheet). Applicant may petition to have an abandoned provisional application revived as a pending provisional application for a period of no longer than 12 months from the filing date of the provisional application where the delay was unintentional. It would be permissible to file a petition for revival later than 12 months from the filing date of the provisional application but only to revive the application for the 12-month period following the filing of the provisional application. Thus, even if the petition were granted to establish the pendency up to the end of the 12-month period, the provisional application would not be considered pending after 12 months from its filing date.